Daphne Romanoff is a singer with the Newton Family Singers. She writes a heart warming essay about what it means for her autistic son Ben to be a part of the Newton Family Singers in this essay. 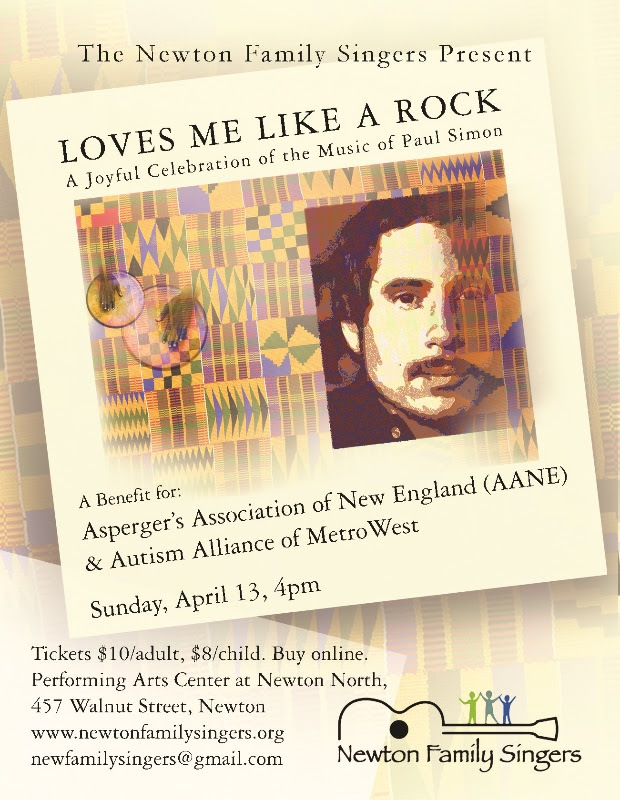 The Newton Family Singers are supporting AANE and the Autism Alliance of MetroWest in this benefit concert, Loves Me Like a Rock. PLEASE LIKE THIS VIDEO!! For every LIKE on YouTube of up to $4,000, our sponsors will give $1 to Asperger’s Association of New England and Autism Alliance of MetroWest. A good, worthy, local cause! Please go here to LIKE the video. In lieu of purchasing tickets for the Loves Me Like a Rock Benefit Concert (always available here), please consider a Family Package of 4 tickets and a mention in our Concert program for a $100 donation by becoming a Family Sponsor. If you have a business or if you know a business owner who might be interested in becoming a corporate sponsor, please let us know. We are offering opportunities to sponsor from $100 to $2000. Visit our new Concert Web Site for details!